So you’re stoked to launch a 9×12 business and area ready to go full-steam ahead. A website is certainly a necessity right? I mean who can be taken seriously without a website these days? Oh and you’ll need an advertising agreement, some informational packets, business cards, and of course a powerful brand name and distinct logo. So should you put all your energy toward prospecting and selling spaces right now or will it be better to start designing agreements, website, brand identity, and everything else to make your business a ‘serious’ contender? I hope it’s not the latter; because the only thing you need is sales. But that’s not what a lot of new 9×12’ers do. They put amazing amounts of time and resources into creating a “big presence” before they actually do anything to generate revenue. They’re scared of prospects not thinking they’re “legit” enough. God forbid a local owner thinks you’re just an independent marketer (gasp!) working from home. They think that building a powerful-looking brand will make getting sales more automatic. You Don’t Have a Business Without Sales! Turn on any random Shark Tank episode and watch entrepreneurs spend all their time and money on brand development, packaging, and extensive market research — only to get painfully humiliated when they admit they have little to no sales to show for it. “How many cold calls have you made? How many doors have you knocked? For some reason, entrepreneurs often think that prospecting, selling, and closing aren’t as important as a fancy website, catchy name, or polished logo. They’ll go through tremendous amounts of effort to bypass the ‘OMG-worst-thing-in-the-world’ act of actually introducing themselves to a local business owner. Anything to avoid a handshake and introduction apparently. Whiz bang product creators try everything they can to claim that prospecting is outdated, ineffective, or downright humiliating. But let me tell you something; that kind of thinking is only promoted by internet marketers who sell t-shirt training, SEO potions, and buggy wordpress plugins. In the real local marketing world, we make physical connections. We share ideas, build relationships, and shake real hands face to face like humans are designed to do. Technology helps and goes a long way, but boots on the ground and ears to the phone are never wrong. Prospecting makes you mentally stronger, more knowledgeable about how local businesses work, more street smart, more recognizable, more credible, and more respected. If you’re the type that wants to hide behind an email address … go waste your money trying to sell mugs and t-shirts to bulldog owners. That’s why these extremely wealthy investors, (who could in all likelihood buy every business in your backyard up with the change in their pocket) are so quick to brush off all the technological ‘vanity’ work done and instead wonder why on God’s earth they haven’t made some effort to actually make real contacts and sell something. 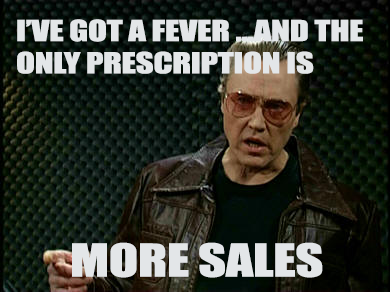 The point is … nothing matters except sales. Everything else can be fixed afterward. If you’re spending hours working on stuff that isn’t generating sales, then you may very well be on the path to disappointment and failure. It’s better to get out and make sales, then invest time and money into technology, branding, and logistics. Even considering the worst case scenario, where you just can’t make any sales; you can regroup or move on and save yourself all the effort you would have spent constructing all this brand-related stuff that didn’t matter. The best thing you can do, and the one that I nearly ALWAYS suggest, is not to present yourself as part of a brand, but rather as a simple local business owner. Forget the whole branded card thing. Your pitch should be that you’re doing this yourself and figure other local owners might want in on it too. Instead of spending $8,000 or more to blanket the entire community, it’ll only be a few hundred bucks between everyone. Burn it into your your mind that it’s just a “thing you’re trying to put together”. Not some kind of giant franchise that you’re opening. There’s a big difference in perception between a fellow business owner who’s got a promising idea to share versus some advertising guy trying to push the latest and greatest advertising opportunity. When you go in cold on your first card armed with all this heavily branded stuff, you look like an ad rep. If you and I were to go out prospecting today for your first card, I sure as hell wouldn’t be introducing myself as “Bob … the owner of the Mega Monster Tulsa Savings Card”. I’d introduce myself as the owner of a small printing business down the road”. I’d explain that I’m trying to get some other local businesses together to share the cost of mailing a big glossy postcard out to every residence & business in the area and wondered if they might be interested in taking a look at it. If they are, I’d put the card in their hands and watch their jaw drop. The card will sell itself once it gets to that point, trust me. See how non-threatening and simple that kind of approach is rather than trying to puff yourself up to look like some conglomerate marketing creation franchise no one’s heard of? It wouldn’t matter if you were the vice president of twitter and walked in to sell twitter ads to local business owners .. most of them wouldn’t give two sh***s and twitter is more known than you’ll ever be. Internet credibility just isn’t going to launch your card. In the internet marketing game, yes, having a great website and lots of authority is critical to success … but this is local marketing where that kind of stuff doesn’t really matter much. Now onto the main topic of this article … the 9×12 website. If you talk with 90% of consistently successful 9×12’ers (or go listen to podcasts or talk with them in the FB group) … you’ll find we all started with little to no web presence. That’s because we never pitched ourselves as having to do with some giant brand. We’re just local owners trying to get other owners together to promote local business and take advantage of marketing that would normally be way too expensive on our own. It’s amazing what can be accomplished when you’re simply honest. It works, believe me. It’s only when we try to make ourselves look bigger than we are that these frustrating problems come up. So do you just go without a website? Well … no not exactly, because I do think websites establish some credibility … but the solution is to just have a regular ol’ website for your marketing business that you give them. If you’re giving them some huge 9×12 branded site then you’re dealing with the whole issues stated above in the article. All you’ve got to do is put a focus on printing on the front page and Wham! you’re suddenly in the printing biz (you know easy it is to offer printing right?). So if they ask your website, simply tell them your printing site, and make sure they understand you’re just a local business owner getting other owners together, etc. Look, the best way I can explain it is that if you make brand look much larger than it is, the more likely you’ll get questioned about it … which leads to nothin’ but problems! Until then, you don’t have a brand, and in all honesty don’t even have a business.